Recently I had the honour of visiting Palestine, more specifically Jerusalem and its neighbouring areas in arguably a time where it has never been safer to do so. The home of the first Qiblah of our Prophet (salla Allāhu ‘alayhi wassalam) and the second instituted masjid ever created on earth; but a more fitting term for this location in accordance with our religiously charged time is the most militarised state in the world. I hope to convey some unconventional reflections from my trip to provide an insight into the land which the world does not see, nor does it want seen. And perhaps for those sitting on the fence, contemplating whether they should make the trip or not with all the conflict, this article could be the answer to your istikhāra you were praying in that regard. The words of wisdom and caution we received before travelling brimmed us with hope but also fear, fuelled from doubts we read and heard from friends and stories back home. We arrived at Tel Aviv International Airport, the largest and busiest airport in the country in the late afternoon. Seeing the sheer number of people in the queues was exhausting, paving the way for thoughts to wonder about what could potentially go wrong. When I reached the immigration desk, after a few checks on my passport, I was asked what my father’s name and grandfather’s name was. Happy to comply, I gave them what they asked for but instead of letting me go through, I was then asked to wait in a different area as they had to make some “further checks”, fuelling doubts about whether there were discrepancies in my lineage! To my amusement, more than half of the group was told to wait here, with no prejudice against age, attire or ethnicity, and almost everyone being asked about their paternal family names even though to this day we struggle to see the correlation. After two hours (apparently a relatively short wait), our passports were returned, and alhamdulillāh we were all granted entry into the country. On the way to the hotel, our guide shared with us a profound gem to summarise this segment of our journey, one that can be applied to all walks of life; not just when you are travelling to lands of oppression. The scholars of Islām say to help us manage our fear, anxiety and general apprehension of the unknown that “the overwhelming majority of things that we fear for the future, never actually end up happening”. It wouldn’t be wrong to assume that like myself, most of our group was worried we would be refused entry and thus spent money we wouldn’t get back, but if we comprehend the reality of this statement, to place our reliance upon Allāh, our heart will be able to rest. This was the land of all the Prophets and Messengers and they were all men who were reliant upon Allāh. We had to wait two hours, which in hindsight is nothing compared to those who live near the focal point, Masjid Al-Aqsā, who have never been allowed to pray in it. They can see it, hear it and even smell it, but despite being a stone’s throw away they haven’t had the chance to visit, yet Allāh invited us from the UK and allowed such an easy passage. We were reminded that He had favoured us, and this is a good omen and an indication to make the most of our visit. And the next morning we did. We headed to Masjid Al-Aqsā for the Fajr Salāh. And as we climbed the steep path towards the compound site, I cast my first sight at the checkpoints and Israeli soldiers I had been warned of back home, but not before I saw a depressing sight. With the Aqsā compound only a few hundred metres away, there were needy Palestinian elderly, women and children, after every other footstep just sitting alongside the wall. My advice for those who are preparing their trip to Palestine is to collect sadaqah from your family and friends with the sole intention of giving it to the Palestinians. Unfortunately, we fail to realise the disparity between our lavish lifestyles in the west in comparison to others. We expect good service in every avenue of life and if we feel we aren’t shown this, we complain. Across the world, they don’t have that right to exercise their opinion on matters due to the struggle between political powers, and they have been relegated to a life of poverty. Passing the numerous wild cats, we made our way up the stairs with the peak of the golden dome slowly revealing itself in its majestic nature, you couldn’t help to pause to take it all in. No descriptive language or even pictures and videos can replicate what it meant to be within that vicinity. The strike of the sunlight against the dome hadn’t even come, yet we were still greeted by a beautiful sight. As we made our way towards the Masjid, there was a stunning outdoor wudū’ fountain placed between the golden dome and Masjid Al-Aqsā. Just as we were heading into the Masjid there was a man outside giving dates, baklava and tea to all the attendees which further boosted that unified community spirit. I naturally assumed that although it was a Friday, this Fajr prayer will be the calm before the inevitable storm for the peak of the congregation will be at Jumu’ah. I was wrong. Even arriving in good time, the closest spot I could find was five rows behind the Imām. To give you a visual representation, the Masjid is 184 feet wide and can hold up to 5,000 worshippers. Later came the time of Jumu’ah and if there was ever a sight befitting of the caption ‘strength in numbers’, it was here. The “Āmīn” was a roar, but a welcome roar. A volume that I myself have never been exposed to with all that is going on in the world and the future of this Muslim civilisation remaining uncertain especially in this part of the world. But Muslims of all different shapes and sizes, ethnicities and origins, hairstyles and beards could come together in one location to remain united in the glorification of Allāh, despite the distractions and external forces lingering outside. However, this blessed day aside, those numbers were sourly missing and it was clear to see the need for many more to travel to this neglected land. After a quick kick about of football with the local Palestinian children, we were given time to tour the markets. It was heartening to see shawarma shop owners give directions to other businesses selling falafel, knowing full well it was not going to further their business or their financial gains. Actions reminiscent of the people of Salahuddin al-Ayyūbi, the great conqueror who recaptured Jerusalem from the crusaders. When he disguised himself to walk among his people to gauge whether they were ready for battle. He found that the shop owners would direct customers to their fellow shop owners, when they had made enough money to feed their family for the day, so they wished for their neighbours to be able to do the same. It was also in the market area that I came to see the manifestation of Israel’s mandatory military service. Average people you would find on a high street but give them a uniform and a gun and suddenly they become very intimidating. The “soldiers” weren’t all bad with some clearly seeming like their job was a chore. I still recall the time a young Palestinian child innocently shook the soldier’s hand with a smile and that was the first time I saw their human side before their combative mask. On my penultimate day in Jerusalem, I bumped into a father of six, who works as a window maker. He casually started a conversation with me while we were both performing wudū’. Just as we were walking to Al-Aqsā for the evening prayers, and seemingly as we were going to part ways I said to him that “we make du’ā for you” to which he said words that will echo with me for a while. Admittedly, I’ve always had a taste for the theatrical, so his response took me by surprise, but delving past the astonishment, I concluded that this man, in addition to the places I visited in Palestine, was teaching me one thing: Taqwa. We have too much fear in our hearts for regulations and disbelievers, but we should divert this fear towards our Creator. We often ask “what we can do to help the situation in Palestine?” but the answer has always been in the Qur’ān. We can’t always blame others for the situation that we are in. We need to make it incumbent upon ourselves to rectify our affairs, internally and externally. This is “our bit”; by aspiring to be closer to Allāh and increasing our Taqwa by eradicating our habitual sins – which need to stop if we are truly sincere in our pursuit of helping the Ummah. Because our sins that we commit daily, wherever we are in the world, affect our brothers and sisters in Palestine and the Ummah at large. To meet this criterion for some includes to strategise and campaign on how to change the situation in Palestine. Sometimes people higher up in the political chain can’t speak about these things, so we, as ordinary working class people must utilise our immense power to speak out without being put down. Then, if in our lifetime, the call for help comes to support our fellow brothers and sisters for the liberation of Jerusalem, we can be part of it. My parting advice to anyone reading this is to visit the land and don’t fall prey to the political propaganda our screens are feeding us. Al-Aqsā’s past, present and future will always be divisive because this is a sacred area for all major religions. Link yourselves to your heritage, not by being sightseers or visitors of tombs and graves. Go to glorify Allāh (subhānahu wa taʿālā), to give salām and support the locals in their cause, to make duʿā, engage in salāh and to pursue barakah. Allāh placed his barakah around this destination; the centre of monotheism where the cradle of culture meets the cradle of civilisation. Thus, you and I must in our heart have an allegiance and a love towards that which was dwelled in by the Prophets of Allāh. May Allāh grant the freedom of Masjid Al-Aqsā and to our brothers and sisters in Palestine. Maulana Rahmatullah Kayranvi (may Allah have mercy on him) (1818-1891) – the Indian origin scholar of the Islamic sciences including jurisprudence best known for his magnum opus ‘Izhar ul Huq or The Truth Revealed!‘ was a honorable warrior in the battle for freedom (also known as the Sepoy Mutiny or The 1857 Uprising) from the British occupied India which took place in 1857. 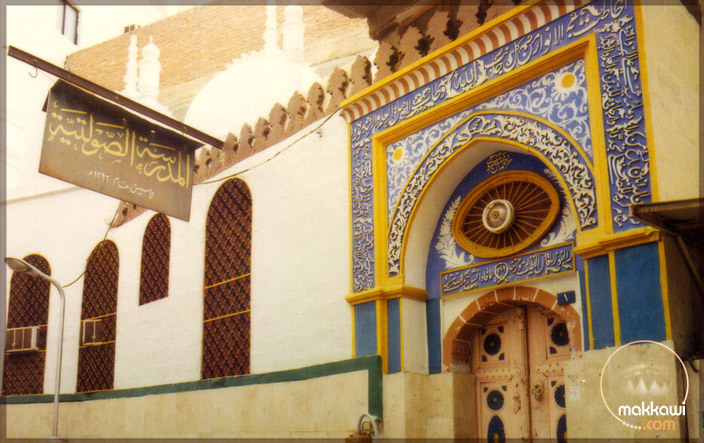 The uprising failed due to various reasons, and Maulana Kayranvi who also happens to be a descendant of the third caliph of Muslims, Caliph Usman bin Affan (may Allah be pleased with him) migrated to Makkah Mukarramah via Mocha, Yemen (where he arrived aboard a ship from Bombay, India). He actually walked the distance of about 600 miles (970 kilometers) from Mocha, Yemen to Makkah which took him about 2 years !! Then the help of Allah subhanahu wa ta’ala descended. Begum Sawlatunnisa (may Allah have mercy on her), a woman known for her generosity and a descendant of the pious Muslim ruler of the erstwhile kingdom of Mysore in South India, Hadrath Tipu Sultan (may Allah have mercy on him) (1750-1799) who fought against the hegemony of the English till his last breath (he died a martyr on the battlefield fighting against them in the fourth Anglo Mysore war) and who is said to be the descendant of the tribe of Quraish of Makkah (the tribe the last Prophet of God, Prophet Muhammad (peace be upon him) belonged to) happened to visit the Holy land (probably for the pilgrimage) around that time. While there, she received news regarding the setting up of the institution. She supported the proposal and donated a considerable amount of 30,000 (currency is not known, even though 30,000 rupees at that time too would have been a lot of money) for the noble cause. 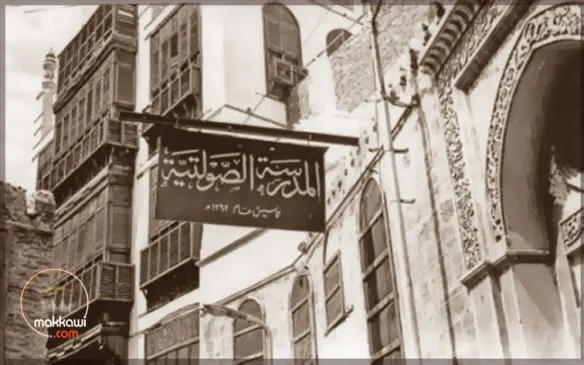 It was then that Maulana Rahmatullah Kayranvi attributed the school to her and named it ‘Madrasah Sawlatiyya’ (founded in 1875 / 1292 H) which continues to exist even to this day (a span of 142 years at the time of posting this article) and tens of thousands have been educated in the Islamic sciences since then. Maulana Kayranvi passed away 16 years later in 1891. Not much is known about Begum Sawlattunnisa after this, not even her death. Probably, she’ll be nothing more than a mere footnote in the pages of history. Yet, in the light of the Glorious Quran and the above Ahadith among many, I leave it to you to calculate the rewards they have and continue to acquire in the hereafter. 2. Pg. No. 208, ‘Leading Ladies Who Made a Difference in the Lives of Others’ by Mufti Abdul Qadir. 3. Pg. No. 36, ‘Women and Waqf – A Series of Translations on Philanthropic and Voluntary Work’ by Imam Mohammad Al Humaidan, Dept. of Studies and External Relations (Kuwait Awqaf Public Foundation). For those who don’t know, the reason Shah Waliullah is so famous and revered within the Indian subcontinent is because he was an intellectual and theological reformer and reviver whose pen reached millions of people after his death through his intellectual masterpieces. He was famously known for translating the Quran into Farsi when the language was popular in the subcontinent, which then led his sons Shah Abdul Qadir and Shah Rafiullah to translate it into Urdu–hence, the majority of the ummah gained access to the Qur’an at a normative level for the first time in that civilization’s history (Shah Abdul Aziz had a tafsir of the Qur’an in Urdu, but not a complete translation). At the same time, be it Deobandi, Ahle Hadith, or Barailwi–most, if not every Indian scholar’s chains of narration in hadith connect to Shah Waliullah. In many other areas of theology and jurisprudence, I would go as far as to refer to Shah sahab as India’s Ibn Taymiyyah in some areas due to his efforts at rationalizing faith and intellect in many scopes of the Islamic sciences. But comparisons aren’t always smart among scholars as each has their own individual contributions which sideliners like myself could never give back through even an iota’s worth. My visit to Quṭubuddin Aḥmad Shah Waliullah al-Dehlawi’s gravesite (1703 – 1762) ended up being much more adventurous, educational, and inspirational than I had initially anticipated it to be. Located in a lightly populated area in Delhi, Shah Waliullah’s grave is located behind Maulana Azad Medical College within the madrasa his family started in the 1600s known as Madrasa al-Raheemiyyah. 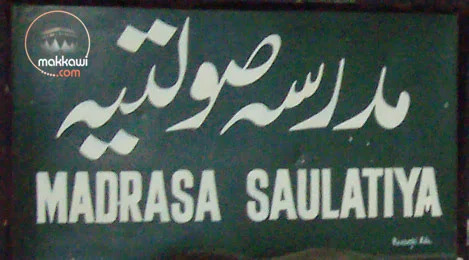 It was so well hidden that many locals did not even know where the madrasa nor his grave was. When I arrived at the gates of Madrasa Raheemiyyah, I began to walk towards my intended place whilst passing hundreds of old and new graves. There were so many graves inside that I had to stand on the side of a grave to make wudu for the prayer! I arrived at Shah Waliullah’s grave and found some men sitting around his tombstone and reading the Quran. Being acquainted with the culture of reverence of graves within India, I did not think much of it. As I was leaving to go into the mosque next door where Shah sahab used to teach some three hundred years ago, one of the men who was sitting by the grave followed me and greeted me. He sat me down and bluntly asked who the man was at whose gravestone he was reciting the Qur’an. Whilst having lived next to this mosque his whole life and having been a frequent visitor, the only (mis)information this man had was that reading Qur’an next to Shah Waliullah’s grave heightens one’s memory. and that the first letter of the Arabic language (alif) was put into the Qur’an through Shah sahib’s efforts. It was sad that someone living so close had no idea who this man was. My dad said it perfectly: “Oh great. Talk about vanishing legacies.” After giving a brief intro to this erudite scholar’s life and correcting some of the misconceptions he had, one of the senior scholars of the madrasa approached me and invited me into his home where we ended up talking about Shah sahab’s life and contributions over tea for the next two hours. 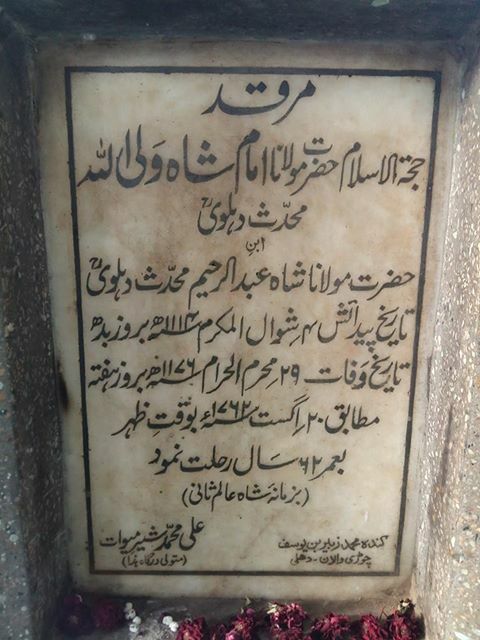 The scholar was Mufti Aziz Ul Rahman Champaarni, a man who excused several people who came to meet him kindly just so he could sit with me and talk about Shah Waliullah (other madrasa students came to visit Shah sahab’s grave as well, but were very much unacquainted with who he was and his contributed efforts). Being in front of an Indian maulana looking like I just got out of the gym was a bit nerve racking, but that light tension went away as Mufti sahab made me feel very comfortable in his home. He was even more delighted when I told him I study at Nadwatul Ulama. After our session, he gifted me books to take back to Lucknow for myself and my teachers. It was quite emotional seeing that and the beyond humble lifestyle he had been living through those couplets. Bhutan/Nepal/ and other surrounding countries have the family of Shah Waliullah to thank for the spread of Islam in the subcontinent. Know yourself by knowing your heritage.